Ever picture yourself as a dollmaker? Earlier this month, I dropped by the Creativ Festival here in Toronto. Remember a few months ago when we shared this free Eucalan Bottle Doll Tutorial? 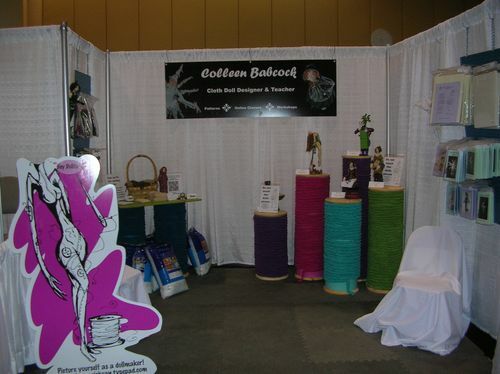 The creator of that tutorial, Colleen Babcock, had an eye-catching booth featuring humongous spools of yarn with dolls perched on top. It was truly a sight to see! Coleen Babcock from The Magic Bean recently published a free tutorial on her blog walking you through the process to turn a bottle of Eucalan into a doll! It's pretty spectacular, and easy enough for the novice doll-maker. Fans of Eucalan know that we're an environmentally-friendly company, but now you can take it one step further – this is a great way to re-use your empty bottle of Eucalan! Why recycle when you can upcycle? Aside from her creative tutorial, Coleen also shares her top five uses for Eucalan – did you know we were that versatile?! Be sure to check out her blog for these tips, plus a chance to win a fantastic Eucalan prize pack! You can read the details on how to enter at the end of her blog post, but hurry – the winner will be chosen on July 28th.